The ‘Fake News’ era is hard to ignore. The term isn’t new, but was really coined during the 2016 American election when it was reported that inaccurate news was being spread to help sway voters opinions. It caught on with the general public, and spread like wildfire. The result is that people are becoming increasingly skeptical to any information that they are exposed to. It’s perhaps no surprise then that the 2018 Edelman Trust Barometer revealed that public trust was significantly dropping in all four key institutions: business, government, NGO’s, and Media. This large drop is a continuing trend that began in 2017. 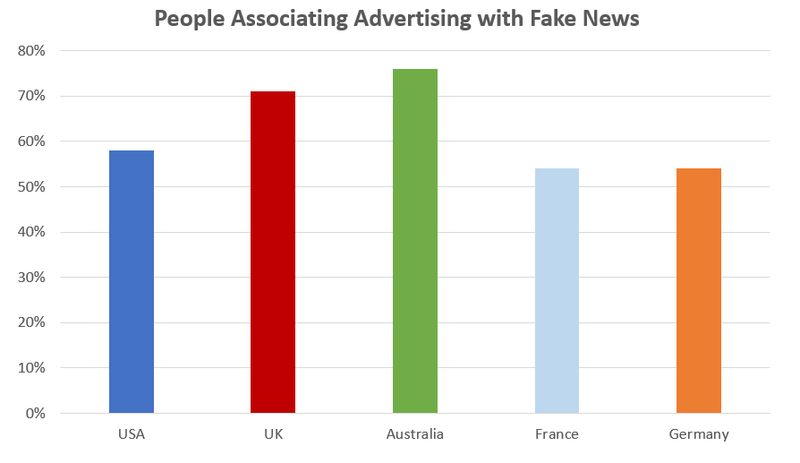 Public skepticism isn’t isolated to the news, according to a study by Rakuten Marketing, in the USA over 58% of people associate online advertising with Fake News. This means that more and more consumers are approaching marketing content with initial skepticism, and it is increasingly hard to win their trust. Trust is one of the most important aspects of human nature, and is a core building block of modern day society. The book Sapiens by Yuval Harari paints an excellent picture of the importance of trust throughout human history. Humans initially started as hunter-gatherers who roamed in small groups or communities. The currency of the time was favors. If you gave me a hand, I expected to pay back the favor in the future. People who didn’t return the favor were outcast, resulting in survival literally depending on trustworthiness. During the Agricultural Revolution humans found a way to grow their communities using shared belief systems (money, religion, politics, etc.). This allowed two strangers to trust each other and work together towards a common goal. Financial currency eventually was born, and along with it came the idea of credit. Credit allowed entrepreneurs to borrow money to follow their dreams, and capitalism hit the ground running. These cultural shifts compounded, and society took off at a rapid pace. Small isolated communities began to merge into massive nations. But none of these shifts could have occurred without an underlying system of trust in place. This erosion of trust is a big deal for marketers. Advertising at it’s core is building trust with strangers. Trust is created through honesty. If people trust you, they will value your relationship. If a customer trusts you, they are more likely to do business with you. With the rise of the digital age in the 1990’s and social media in the 2000’s content became easier than ever to share, and Content Marketing as we know it was born. Blog posts and white papers quickly became the gold standard for marketers looking to build trust in their product, but is it working? A 2017 survey by McCann found that 42% of Americans find brands less truthful than 20 years ago. The Eldeman report cited a 20 point decrease in US consumers trust of businesses in the last year. Content Marketing is designed to help but a lot of articles are written with a clear bias to the product, which results in a level of manipulation. People are beginning to recognize the biases, and Content Marketing is losing it’s impact. People don’t like to be sold, we want to feel like we are in control of the decisions we make. 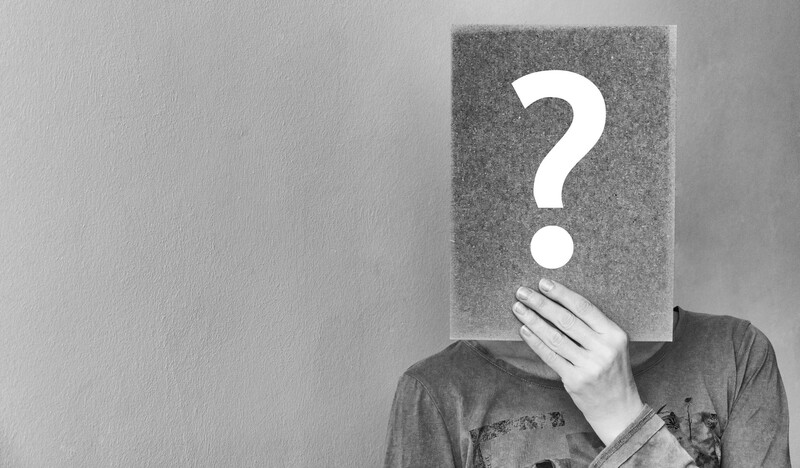 However, we do have a natural curiosity to learn; 81% of US consumers believe that online advertising is useful if they learn something about an area of interest, and doesn’t interrupt their online experience. In order to build trust with potential customers, we must first reach them. This is also becoming increasingly difficult for a number of reasons. When Dropbox was a startup they found that the majority of their targeted customers were not actively looking for their product. This resulted in traditional online advertising (ie. Search) not working. They were able to generate more interest by actively seeking out where their targeted customers spent their time online, and tailoring content to fit their needs. 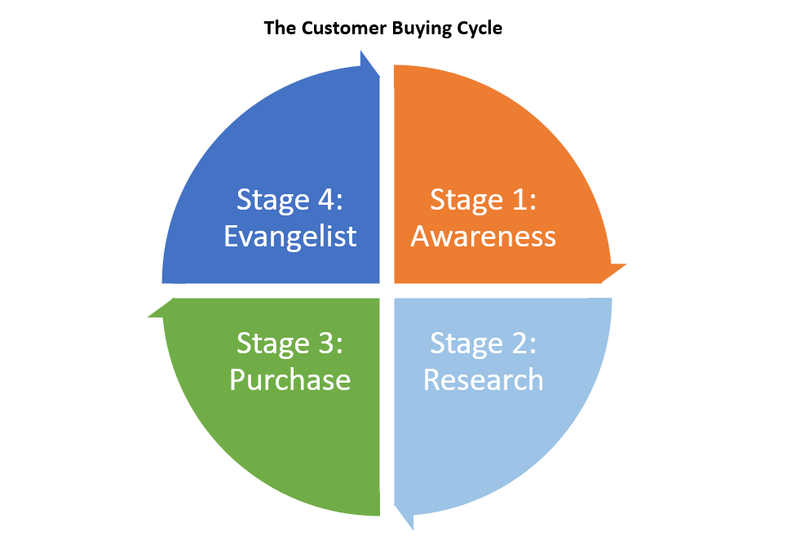 Customers not actively looking to purchase a product fit within the ‘Awareness’ stage of the Buying Cycle. People in this stage are forming general opinions on topics, and rely more on intuition. Psychologists refer to this as System 1 or ‘fast’ thinking. With the rise of social media and internet advertising, the average consumer filters through 5,000 ads per day, which overwhelms System 1 thought. In order to make sense of the massive amount of information we are exposed to, humans have developed subconscious filtering methods called heuristics. Most people aren’t aware we are using heuristics, which can lead to cognitive biases. System 2 thinking, or ‘slow’ thinking, is triggered once a customer moves into the research stage. They develop an interest in the topic and dive deeper, consciously spending more effort and attention forming and validating opinions. Although System 2 thinking is thought of as conscious decision making, System 1 highly influences it through heuristics. This is why ‘click-bait’ titles work, they cater to intuition. We generally click the title, see if we are interested in the article, if it doesn’t meet expectations we move on and forget it. For content to resonate, it needs to catch the attention of System 2 by providing genuine value. Finding this balance will make an impression with the reader. A few heuristics to be aware of are the availability and familiarity heuristics. Consumers will begin their research with products they are already are aware of, and are more likely to purchase a product they are familiar with. This enforces the importance of generating awareness. The communities that consumers are involved with also come into play through social heuristics. People who are relying on intuition are more likely to be swayed by social opinion, which reinforces the importance of communities for marketers. The end result is that people within the Awareness stage happen to be the ones impacted the most by the current trust crisis. When people do not trust businesses they will rely more heavily on the opinions of their community. If the the majority of the general public distrusts businesses, it can quickly become a negative feedback loop. If we combine Dropbox’s findings with our knowledge of how humans make decisions, we can choose the best tactics for building trust and generating awareness of our product. Thought Leadership has morphed into a catch-all phrase for any form of content marketing, but this is not what true thought leadership is. Thought Leadership is not product focused, it is people focused. It shines light on ideas and topics of interest to the target market. To be effective, it needs to be authentic and provide knowledge that will genuinely help someone learn. This creates value (ie. a favor) for the reader, and in turn builds trust. When we see an article where Jeff Bezos, the CEO of Amazon, shares knowledge about how to effectively run meetings, we stop and read. Running meetings really has nothing to do with Amazon’s product, but we all know Jeff Bezos is an expert entrepreneur. If the knowledge Jeff shares is valuable for the reader, it builds trust. This trust will then be indirectly tied to Jeff’s product — Amazon. When choosing topics look beyond the product specs, and into the community that the product impacts. Appealing to the broader interests of your targeted community will open up a world of opportunity for content. Create content that answers the questions they have, or provide ideas around areas of interest. Let’s say you sell treadmills, and you are a running fanatic. Create content on the benefits of running. You’ll be able to provide insight and have an instant connection with your audience of other runners (who just happen to be your target market…). Just remember, focus on helping the reader, not pushing product. This is what readers within the Awareness stage are looking for. Our desire for community has shifted online, we are all likely part of a virtual community. Medium is a great example. People join because they are interested in certain topics, and this is a place where we can learn from, and interact with, others who have similar interests. If we come across a good idea we share it. There are two options when it comes to utilizing communities: Build your own, or leverage existing ones. Each have their own advantages. Building a community can take a lot of time and effort, but it allows you to have a larger level of control over the narrative. It can be easier to start with leveraging communities, and as your user-base grows the focus can be turned towards fostering your own community. If you go to Reddit you’re likely to find a community for almost anything. Medium has multiple publications on a large variety of topics. Find these communities and start actively contributing. Lead the narrative and build a culture surrounding your company. From a marketing standpoint, communities help you find customers willing to spread the word about your product and convert other customers to Evangelists too. A community of customers generating positive word-of-mouth surrounding your product may be your most powerful tool. From a Product Management standpoint, building a community of customers will allow you to build relationships and gain product feedback. The more you involve your community, the more emotionally invested they become in your product. The emergence of Influencer Marketing is a growing trend. Influencers are people who have the ability to change the thinking or behavior of a specific community through their reach and credibility. Influencer Marketing is sponsoring an Influencer within a community tied to your product. You are essentially purchasing an Evangelist, which is a quick way to gain the attention of a targeted community. The community trusts the Influencer, and the brand leverages the trust that the Influencer has built. For the Influencer to remain as authentic they will need to be genuinely interested in your brand, have common goals, and have the ability to speak about the positives and negatives. Influencer marketing has also impacted celebrity endorsements. Under Armour’s COO, Patrick Frisk, recently mentioned that Dwayne “The Rock” Johnson passed Steph Curry as Under Armour’s most valuable endorser. The Rock’s campaign doesn’t rely on star power alone, but on being a motivator for the masses. The Rock’s brand is about hard work and perseverance paying off, which resonates with almost anyone. Being a star alone is not enough, you also need to stand for something people relate to. The majority of products don’t need world-famous celebrities, but we do need niche celebrities. Find the thought leaders within the communities you target. Once onboard, ensure they are an active member of your community just like any other customer. There is one big risk to Influencer marketing. Once you begin to pay someone to represent your brand, consumers will naturally question the authenticity of the relationship. Here is a solid guide on how to build effective, authentic, partnerships with Influencers. With a trust crisis in full swing, authenticity is more important than ever. To have the greatest impact, your marketing should be centered on building trust between your brand and your audience. Take a look at your current marketing strategy and make sure that you are focused on creating content that truly provides value. This story is published in The Startup, Medium’s largest entrepreneurship publication followed by 327,829+ people. On the road of discovering what it means to be a Product Manager, passing on the knowledge I gain along the way. Product Manager @ CentralSquare Technologies.